Pisa’s Palazzo Blu is continuing to gain ever greater reputation for the imaginative exhibitions it holds there. The current main exhibition is that on Salvador Dali and is called ‘Il sogno del classico’ (the classical dream). It continues until the end of February. The majority of the works, indeed, reflect the great Italian renaissance painters, in particular Michelangelo and Raphael. There are also 102 brilliant xylographic illustrations Dali did for an edition of Dante’s divine comedy (commissioned by the Italian government in 1950) and for Cellini’s autobiography. 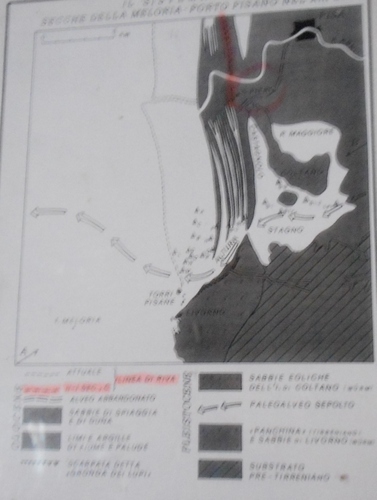 (Photography is not allowed at the main exhibition so I have borrowed these pictures courtesy of the Palazzo Blu). It’s quite pointless to start one’s painting career as a pseudo-abstractionist. Learning the proportions, the chiaroscuros, the poses, which form the basis of figurative art, is essential. Early pictures show how Dali started off in impressionist key as, indeed, did Picasso. Chinese stories as depicted by Chen Jian Hong born in Tianjin in the north of the country. This runs until 5th February 2017 and is quite delightful. The Arno flood which also tragically hit Pisa on 4th November 1966 (although the Florence devastation is the one largely remembered by most people today). If you still manage to see more after these three exhibitions then why not visit the Palazzo Blu’s permanent exhibition which is free. This was further expanded in 2013 and presents the interior of an aristocratic Pisan palace with its furnishings and decorations to perfection and a wonderful collection of paintings including an Artenisia Gentileschi. It’s remarkable to think that this palace, once the home of Giulio Rosselmini Gualandi family until the 1970’s, was in a state of near dilapidation until the Fondazione Cassa di Risparmio di Pisa purchased the building in 2001 and opened it to the public for the first time in 2008. Truly, the Palazzo Blu with its original aquamarine exterior colour is a worthy competitor to Florence’s Palazzo Strozzi, in terms of the presentation and interest of its temporary exhibitions. It’s great to see two major Chinese artists’ exhibitions near us, especially when we had such a fascinating time during our first visit to that country so recently. Lovers of early music (i.e. some of the best, most exciting music ever written) should remember for next year that the 21st Festival Toscano di Musica Antica has been in full swing in Pisa and ended this Sunday 28th August. Thanks to a friend I was reminded of this superb festival and by 7 pm was entering the glorious cloister of the church of san Francesco in whose chapter house the first concert was to be held. 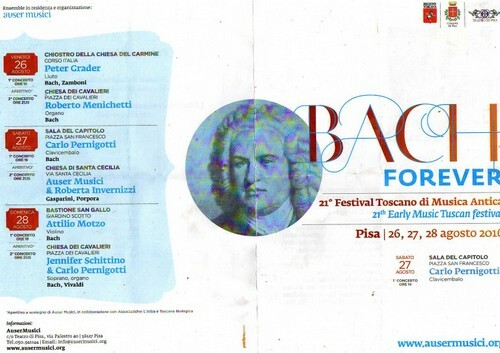 The festival’s title this year was ‘Bach forever’ and was chosen by its artistic director, Carlo Ipata, whose Auser (ancient name for Serchio river) band has become one of Italy’s premiere period music ensembles. ‘Bach forever’, for Bach never dies and if our solar system implodes then an exo-planet may well receive the sound contents of Voyager launched in 1977 and which includes the Maestro’s Brandenburg Concerto no 2. The chapter house has some beautiful frescoes by Niccolò di Pietro Gerini, a late gothic painter from Florence illustrating scenes from the life of Christ and dating from 1392. My pieces are an honest method, by which the amateurs of the keyboard are shown a clear way not only 1. To learn to play cleanly in two parts, but also, after further progress, 2. to handle three obligate parts correctly and well; and along with this not only to obtain good ideas but to develop the same well; above all, however, to achieve a cantabile style in playing and at the same time acquire a strong foretaste of composition. Never could such academically titled pieces sound more enjoyable, for Bach is the supreme combiner of erudition and entertainment and they were played with fluency by the young Carlo Pernigotti. As an encore Carlo played a moving piece by Froberger, a predecessor greatly admired by Bach, dedicated to the memory of a friend who’d died in a domestic accident. Pernigotti stated that he felt that, in the present tragic time that Italy finds itself, this piece, called a tombeau, would be a suitable closure to his concert. Its plangent harmonies and deep sentiments were totally appropriate. Indeed, ever more so since his friend, the lutenist Blancrocher, fell to his death down a flight of steps which collapsed, an event – depicted by an eerily descending scale – which happened to several of the victims of Amatrice and adjoining villages. During the concert’s interval an ‘apericena’ (dinner with aperitivo) was served courtesy of the l’alba (dawn) association. We were treated to farro dishes with fish sauce and as much prosecco as we desired. L’alba is a laudable association which aims at furthering autonomy for disadvantaged people. 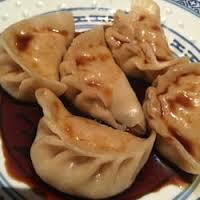 It does this through various means, the main one being catering. 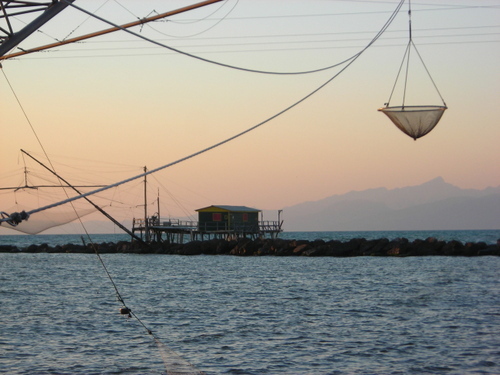 It has a bathing establishment called ‘Big Fish’ at Marina di Pisa, sheltered flats for helping people towards autonomy, art-therapy courses, ceramics workshops and restaurants and cafes serving natural products prepared under the supervision of professional chefs. For more information visit their web site at http://www.lalbassociazione.com. Italy works largely through voluntary associations. We can see this is the situation around Amatrice but we can also see this in our local area where volunteer ambulances and first aid services are run by unpaid, enthusiastic persons. While the politicians gobble up the people’s taxes the people who truly run Italy are its voluntary associations. (Incidentally, there’s a similar type of restaurant in piazza San Francesco, Lucca. The food is delicious and it’s enhanced by the fact that one is helping people who’ve suffered traumas to re-establish themselves. I remember a similar place in Woolwich London SE called the citizen’s gallery. I wonder if it is still functioning). After a taste of south Italian Amari at a corner bar we wended our way to the church of Santa Cecilia (who appropriately is the patron saint of music.). The Saint Cecilia church is another of those disgracefully neglected but very beautiful churches which those who can tear themselves away from the Piazza dei Miracoli will be able to enjoy. Founded around 1103 Santa Cecilia is a single nave church graced by a double lancet window around which are sited those rare Islamic ceramics one can find in a few other places in our area (e.g. at San Cassiano). The campanile, like Saint Francis’ church, is propped on top of the roof and is supported internally by a columnar structure. This is an excellent solution to the scarcity of land for a separate campanile and without sacrificing the church’s internal congregational space. The altar is crowned by a painting of the martyrdom of Saint Cecilia by Salimbeni dated 1607. The program consisted mainly of arias from Gasparini’s operas. As in the case of the harpsichord recital we had seats on the front row and almost felt that she was singing just for us. It was an ecstatic experience for me and I forgot the stifling heat which summer Pisa generates, particularly within its buildings. Carlo Ipata explained that this concert was part of a project to issue a new CD of Gasparini’s vocal music. In case you haven’t come across Gasparini, neither did I until my friend introduced me to him. Briefly, Gasparini is almost a local lad, having been born in Camaiore in 1661. His teacher was no less than Corelli under whom he studied in Rome and where his first opera ‘Roderico’ was produced. In 1702 he went to Venice and worked for ’La Pieta’ before he left and gave the job to Antonio Vivaldi. Returning to Rome in 1720 Gasparini produced his last big opera ‘Tigrane’. J.S Bach appreciated Gasparini and copied his Missa canonica for use in Leipzig. Gasparini became teacher of, among others, Marcello, Quantz and Domenico Scarlatti. It’s quite astonishing how such an important musical figure could have become completely unknown until rediscovered by the likes of Carlo Ipata. The evening concluded with La Invernizzi singing a seductive cantata by another composer who is constantly rising in my estimation, Nicola Porpora. I could tell you more about Porpora, who gave Handel some tough competition while in London, but will spare you. Just watch and listen to this production of Porpora’s ‘Semiramide riconosciuta’ if you have not yet been converted to his luscious music. Thankyou Roberta and thankyou Carlo for bringing back to us music which for far too long has been lying under piles of dust and now is finally able to witness a sunlit resurrection and new life under your immaculate musicianship. When you are going from the Lucchesia to Pisa airport to fly back to Brexit Britain why not make the journey a little more exciting? 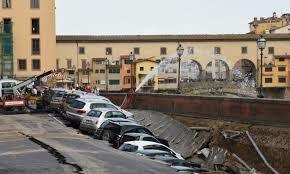 An occasion arose for me to do this the other day and a detour to Marina di Pisa was well-worth it. First, we stopped at the ancient church of San Piero a Grado which dates back to at least the eighth century. It marks the spot where Saint Peter is traditionally supposed to have first landed on Italian soil from whence he travelled to Rome and to his eventual upside-down crucifixion. 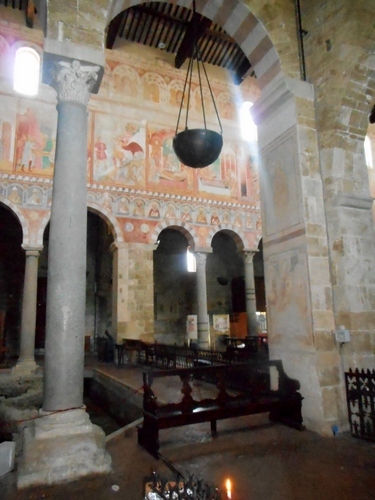 The church is unusual in having an apse at each end and of using roman capitals for its columns. It is, thus a truly basilican plan in the classical sense and exudes an extraordinary atmosphere of peace and veneration. Surrounded by large lawns San Piero is one of the earliest examples of that Pisan Romanesque which found its apotheosis in Pisa’s own cathedral. 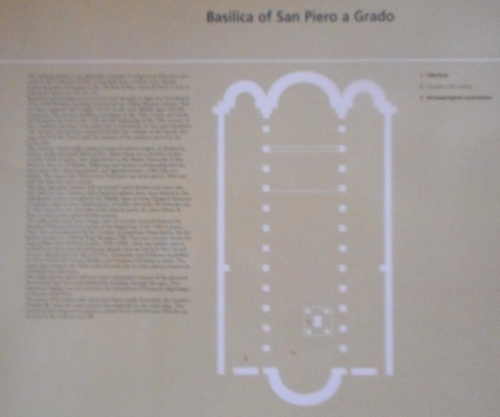 One of the several unusual exterior features of San Piero a Grado, which is now classed as a minor basilica and titled ‘messenger of peace’, are the Islamic plates inserted in the upper lunettes. I always find that these decorations are a sort of metaphor that Christian and Islam can co-exist peacefully. The church’s interior, which is very spacious and is crowned by a wooden truss roof, consists of a nave and two aisles. The upper walls are almost completely covered by frescos which are more faded on one side than the other, probably because of the greater amount of sunlight they received. They were painted by Deodato Orlandi from Lucca in the early 14th century and illustrate, in addition to the life of Saint Peter, the lives of St Paul, Constantine and St Sylvester. 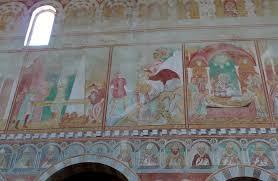 Below these frescoes are portraits of all the popes up to that time. At the west end of the basilica is a large ciborium, or canopy over an altar, in 15th gothic century style which marks the place where St Peter delivered his first sermon upon landing on the Italian shore. In case you were wondering what happened to the sea all this area was once a lagoon and the church was built on a higher level overlooking it. Since that time the sea has silted up and is now a good five miles away. 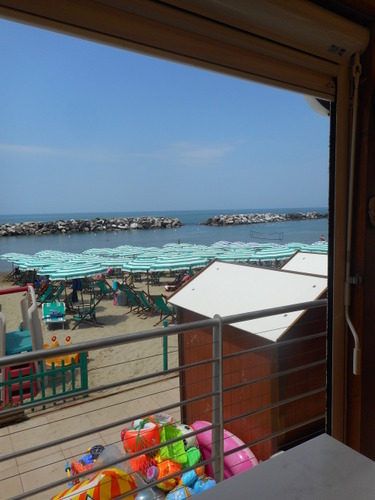 Moving to more secular matters we travelled on to Marina di Pisa which a remarkably quiet, relaxed and family-oriented seaside resort quite unlike the worldly hub-bub of Viareggio. Once the favourite hangouts of artists and composers like Puccini and D’Annunzio, it has seen a recent revival of its fortunes thanks to the construction of a relatively inoffensive new marina with some lovely landscaped coastal-plant gardens around it. There is an adequate public beach which I once remember as having no sand on it as persistent erosion had swept it all away. Happily today the sandy beach has been built up again and it’s really pleasant to lie on it and have a cooling swim before the hordes of summer crowds really start moving in for the High Holiday season. The sea promenade is lined with a variety of restaurants of varying costs. We found a friendly one and were served well with mussels, cutlets chips, melon and ham. On a more sombre note there’s a memorial park with a propeller belonging to the Hercules aircraft from the nearby military airport and which was shot down with all its Italian crew members during the Bosnian war in 1992. Unfortunately the airport timetable caught up on us and we had to leave without really giving a look this attractive place with its fin-de-siècle atmosphere deserves. What would be a British seaside resort equivalent for it, I wonder? Worthing perhaps? There was no British equivalent, however for the wonderful sunshine we experienced before heading on to meet our guest at the airport. I’d heard about her when helping to make the English version of a film about Cascina. 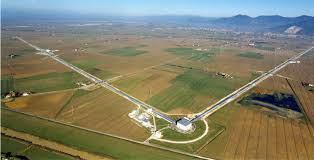 She’s the Gravitational wave Interferometer, called VIRGO, which will tell us so much more about how and when things began. 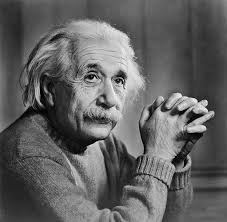 Einstein posited, as part of his theory of general relativity in 1916, the existence of gravitational waves in addition to electromagnetic ones. Marconi had famously discovered how to use the electromagnetic ones and his experiments at Poldu, Cornwall produced the first wireless signal across the Atlantic. Yet even with powerful telescopes of both the optical and radio variety we can ‘see’ just five per cent of the universe. The remaining 95% consists of dark matter and black holes. How could anyone possibly measure and observe them? Precisely through the interferometer which picks up any gravitational wave produced by spectacular events, including the collision of binary pulsar stars and, indeed, the original ‘big bang’ itself. How does it do this? A laser beam is divided into two, each one fired through separate vacuum sealed tubes, 3 kilometres long and set in an L shape on the flat alluvial plain of the Arno near Cascina The two separate beams are then returned to a finishing point and if there is any unphasing or discrepancy in their return then this signifies that they have been ‘interfered with’ by a gravitational wave. Or have they? That’s the question. Much of the research at Virgo is spent on filtering out redundant vibrations caused by traffic, earth tremors etc. What happens when a gravitational wave hits our planet’s space-time continuum? There’s an infinitesimal change in our appearance and the appearance of objects. We and they oscillate the width of a hair’s breadth in length and breadth – such is the sensitivity of the measurements to be recorded. Fortunately I have yet to meet a person who confesses they know how it feels to be hit by a gravitational wave. 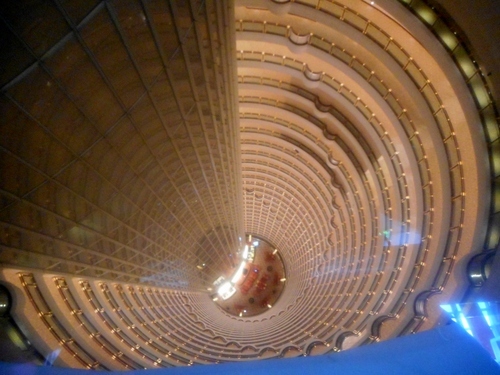 With the mind pulsating with space-time and waves I was privileged to join a specialist group last Saturday at Virgo. First, we were treated to a seminar where Prof Dattilo introduced us to the concepts involved. It was nice to have two of his children participating in the event and there was plenty of time for questions afterwards. We then ventured into the control room where scientists work out the data received from the interferometer. As the visit was after working hours the room was empty but there was some evidence of the hard work involved here. God said, “Let LIGO be!” and all was light. Except, of course that we are talking about the darkest of matter, black holes themselves. PS Cascina itself is a delightful place to visit. See my post at https://longoio2.wordpress.com/2016/02/12/something-about-cascina/ for more details. Blogs have been around for some time. Although the term was first coined by Jorn Barger in 1999 (‘web log’, later abbreviated to ‘blog’), there were several precursors: bulletin boards and newsgroups started back in the 1980’s. I wish I’d begun blogging earlier. However, going back through my emails I see that there’s a vague attempt to describe the photographs I was taking and the activities I was doing. When it’s been raining almost continuously for the past three days there’s no better indoor pastime to occupy oneself than going through one’s photographs from the past. May 20th 2007 was a day celebrating women artists with two main exhibition centres. The first was held at the limonaia (conservatory where lemon plants are protected in winter) at Palazzo Ruschi in Pisa. After the usual story of decline and fall of aristocratic families the palazzo was acquired by Hewlett-Packard, the computer company, in 1990. They restored the limonaia to its former glory but subsequently moved on, allowing the city of Pisa buy the limonaia and use it for exhibitions and conferences. The palace’s gardens are quite beautiful and filled with a variety of exotic trees and plants. I particularly liked the statue of Flora raised upon a dolphin on one of the gardens’ water basins. 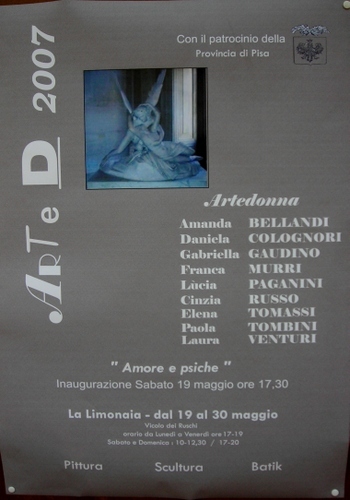 The theme of the exhibition at the limonaia was ‘Amore e Psyche’ (Cupid and Psyche) and the quality of the contemporary art was exceptionally high. There were many fine art works on display and, as usual for these events, a great ‘rinfresco’ (free buffet). 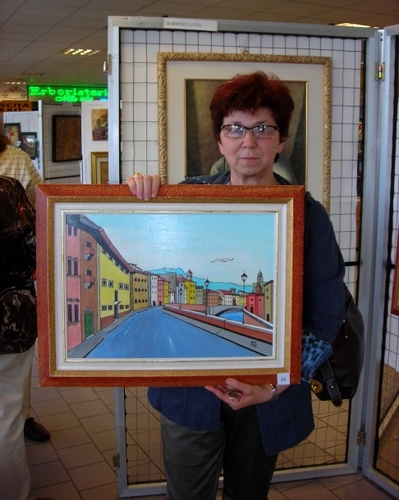 I bought a picture of the Pisa riverfront from this artist. The picture is signed M.P.5. I regret to say that the artist is now no longer with us. Calcinaia’s symbol is its tower built by the Upezzinghi family. Dating from the thirteenth century the tower was part of the fortifications guarding the river crossing. Like Pisa’s limonaia it fell into abandonment until rescued and restored in 1999 by the comune for use as an exhibition centre. Incidentally, Uguccionella, the mother of Count Ugolino mentioned in Dante’s Divine Comedy, was born in Calcinaia. 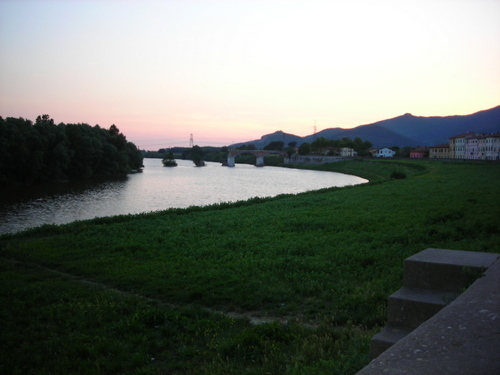 It was a lovely day in a lovely place and the sunset over the Arno running past this town was beautiful.